You have a best-in-class enterprise asset management solution. But you may just be scratching the surface of what Infor EAM can do for your maintenance team’s productivity and your organization’s overall bottom line. That’s why Infor Education is offering Infor TechEd. Get the most out of your technology investment and optimize how you handle both strategic and day-to-day maintenance activities. 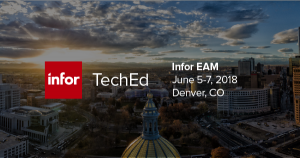 Infor TechEd is a 2.5-day technical education conference that will be held Tuesday, June 5 through Thursday, June 7, 2018, in Denver, CO. You’ll be able to mingle with like-minded colleagues, hear the latest strategy updates and product announcements, dive into hands-on training, and interact with a broad range of product experts and management team members. You can mix and match sessions from the different topics, plus attend keynotes, panel discussions, and a hands-on open lab. What makes Infor TechEd unique? This is an intimate conference, with fewer than 100 attendees. The event is kept small to provide plenty of 1:1 opportunities with the product experts along with networking time between sessions for you and your peers. Sessions are two hours long, providing time to gain in-depth knowledge. With multiple sessions on popular topics and fewer attendees than at large events, you’re very likely to get the spot in the session you want or even listen to it twice. Along with that, we provide an open lab so you can go test out the concepts you have learned. The EAM user advisory board has asked for more training and Infor Education is going to provide it. Approval to attend may be easier to secure. This is an educational event that will provide you with valuable concepts you can implement right away. It’s in a very easily accessible area, right in the heart of Denver, at the beginning of June when the weather should be just perfect. To learn more about Infor EAM TechEd, read the brochure. You can register here.